Welcome to Prem Machine ToolsManufacturer & Exporter of Expandable Polystyrene Molding MachinesThe company was established in the year 1992. Our well integrated facilities & In house quality testingdepartment make us the first choice of our clients. competitive prices, Qualitative machinery & Timely delivery of consignments make us the first choice ofour clients. We are engaged in offering Machine Tools & EPS Products. Our EPS Boxes, Sheets, Plates & Cups are widely acclaimed in the industry. Along with that we provide wide array of Machine & Machine Tools. We also offer Paper Rewinders & Plate Making Machines at market leading prices. 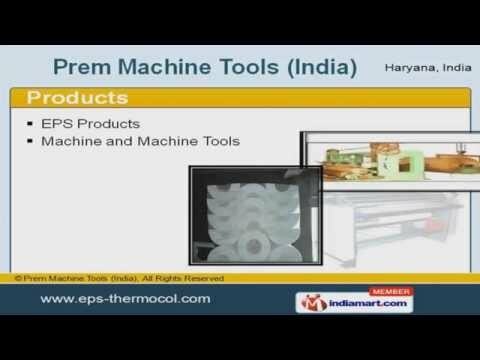 Thermocol EPS Mould Machinery & Surface Rewinders are some of our best selling products. We provide premium grade Thermocol Preforming & Cutting Machines.